There is something very intimate about walking in a Pacific NW Old Growth forest on a rainy day. 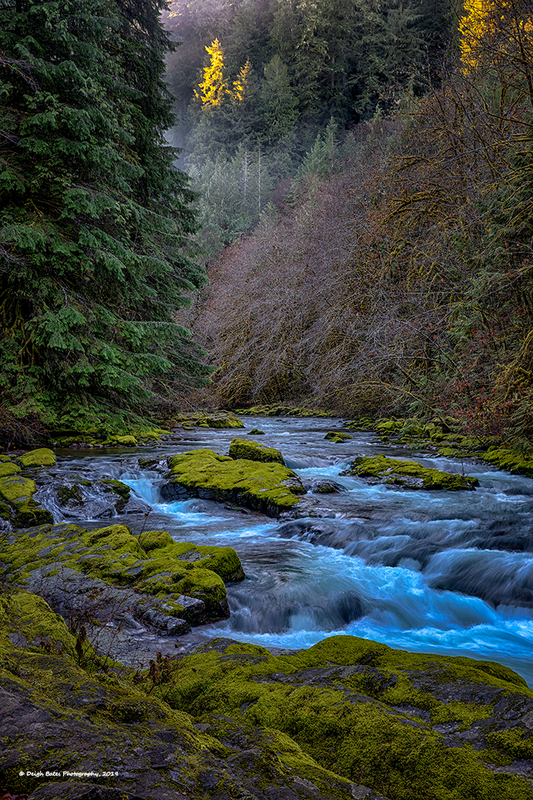 Such was this morning as I hiked along the trail leading to Sweet Creek Falls. 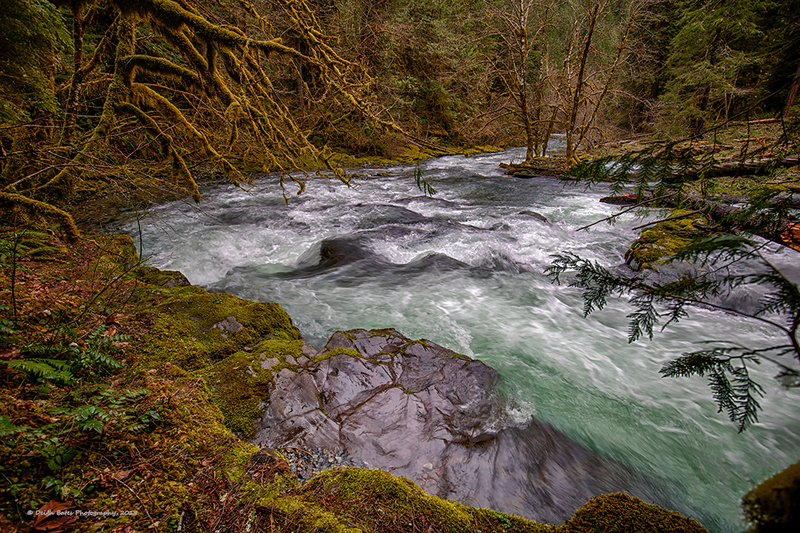 Pouring rain, alder and vine maple bursting bud, the first of the year trillium blooms and a wonderful stream dancing its way to join the Siuslaw River all quieted my mind and made me glad for where I was. I parked at the upper trail head which made for an easier walk to the falls but I was soaked when I got there. Luckily I had a rain shield for my camera which while rather clumsy to use it kept the rain off while walking. I think this waterfall is one of my favorites and the soft morning light and moderate flows help to set it off in its little grotto. There was a bit of mental tug-o-war going on for me this morning – head to the mountains or the gym. The mountains won. 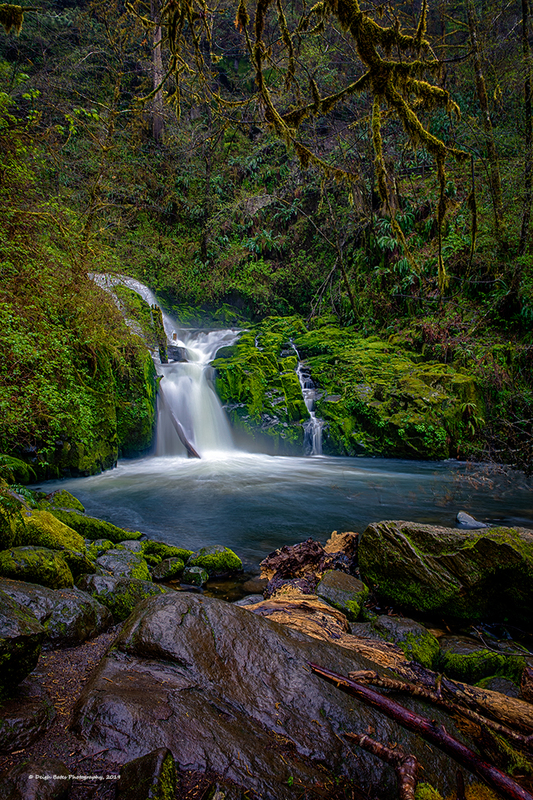 I was perusing The Waterfall Lovers Guide book the other night and realized that there was a complete set of waterfalls up the Row River that I had never seen let alone photographed. With those in mind I left early hoping for morning light. The recent snow storms caused a lot of damage to the timber stands along the road and Brice Creek itself. The Forest Service has done an admirable job in clearing the road but only got as far as Champion Creek and where I wanted to go was well beyond the barricade set up at the bridge. First stop (above) was below Hobo Camp. Nice little cascade. Went to the next big pullout/access point and found two images. 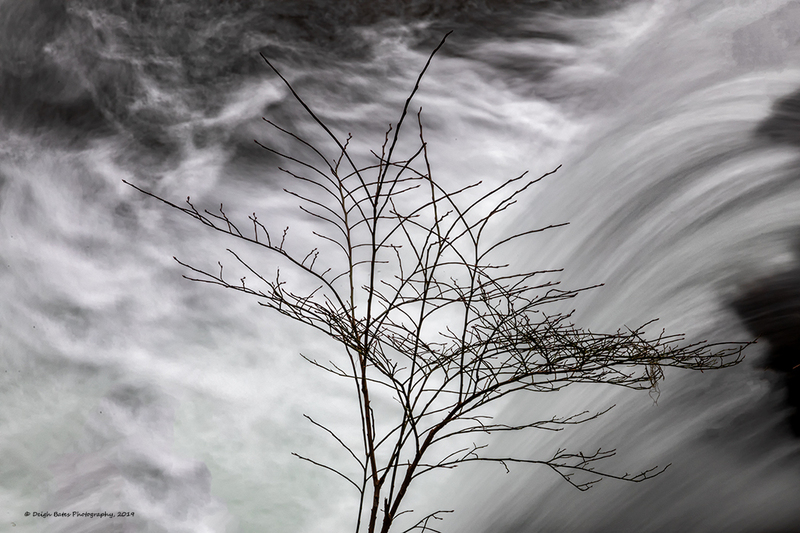 One was of a still bare bit of brush standing against the turmoil of the flow…. … and the second was looking downstream – as you can see the spring flows are filling the channel. Click for larger views. Had a great morning in a wonderful watershed. So nice to be back behind the lens feeling somewhat competent. 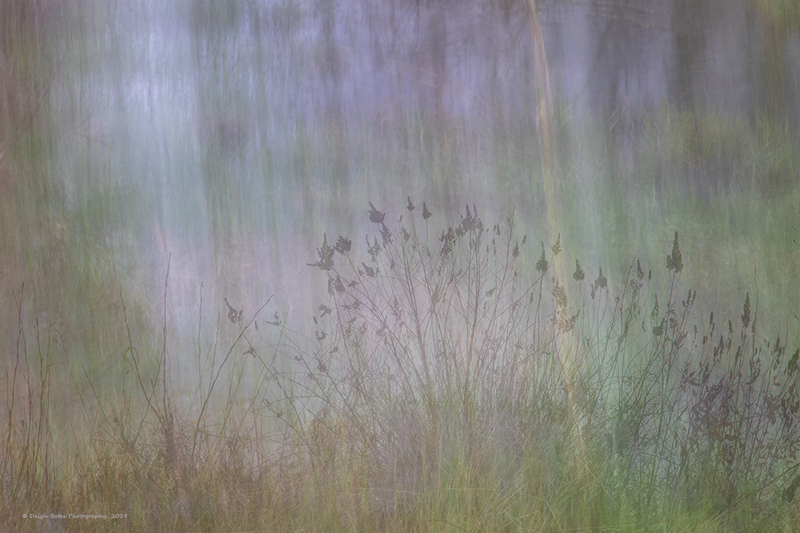 I spent some time just wandering the banks and found what I and many others have come to call an intimate landscape. Caught in the flow. Comments are more than welcome and you can always get a larger view on your monitor by clicking on an image. A Winter Storm Advisory was posted for the Cascades this morning with snow, wind and cold making up the prediction. Seemed like a really good time to head for the mountains. Following a tip/advice from my friend Tim I headed to Oakridge and then up Highway 58 and Salt Creek. Above 2,500 feet the fresh snow painted the trees but the driving was easy – bit icy but nothing too drastic. 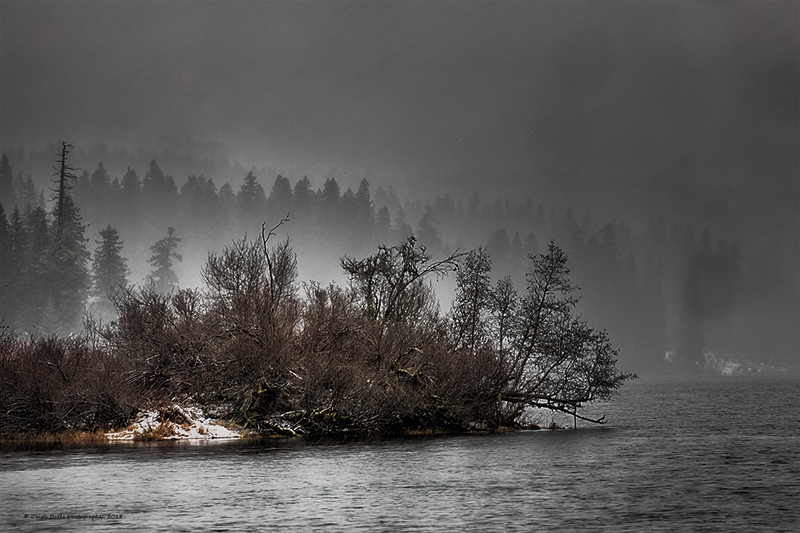 I went over Willamette Pass toward the town of Crescent and on the way dropped down thru the snow to gather this image. The sun was breaking thru the eastern sky and brightening Diamond Peak. You can tell that the view did not last long – that dark cloud settled in after about 30 minutes – worked for me as I was really cold from the 21 degree weather and stiff breeze coming over the lake. It was a winter wonderland. This morning I read an article by Guy Tal about photography as being almost a meditative or at least contemplative activity for some of us. I guess there is still a place for snap shots (phones) and street photography but it does not appeal much to me these days. I have slowed down a lot and come back from a solitary day in the field with very few images. Sometimes that means composing the image in my mind, taking the shot(s) with all the attendant technical camera adjustments and then processing it to get what gelled in my mind in the field. Such was the case with the image below. Two shots – one with deliberate camera movement and the other shot crystal sharp. Combined in post processing. Still so much to remember and think about as I feel like a Beginner most of the time. Thanks for looking and reading and as always I welcome your comments. 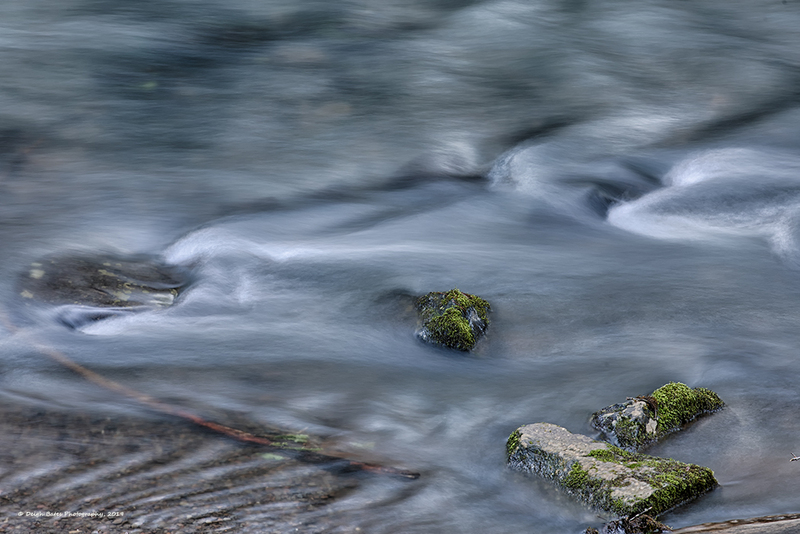 I have photographed in the Row River watershed on many past occasions and the images are always different and pleasing in their own way. Seasons, light and streamflow all contribute to unique compositions and today was no different. It was still dark when I left home and the Valley was filled with dense fog. At times fog can really add to compositions so I was hopeful for some shots that were highlighted with fog but as I drove up the Row River road the fog began to clear. The image below was just along the highway near the town of Dorena. 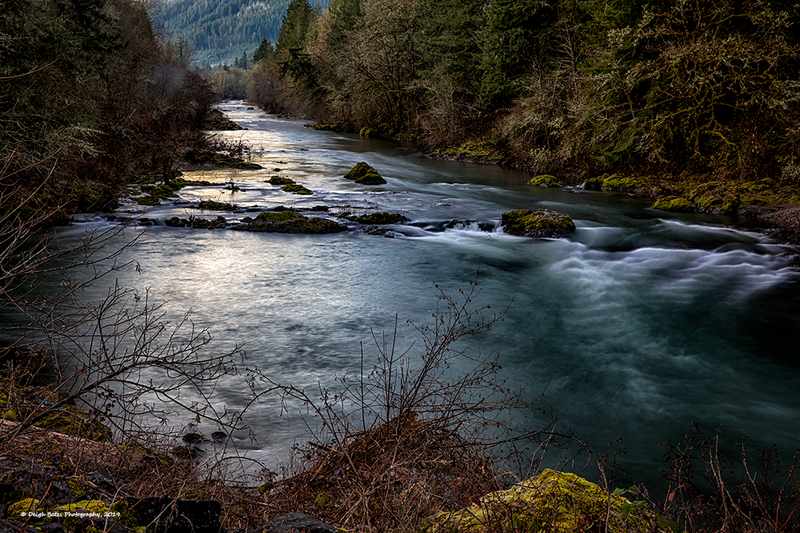 First light just coming onto the river – silver flow. Heading upriver I parked at the Cedar Creek CG and took the footbridge to the far side of the river and headed upstream on the river trail. The trail has a lot of viewpoints and some big rock outcrops that allow you to get out for some – what I hope – good compositions. The light was just beginning to fill up the canyon – I like to think it was great timing on my part but I am pretty sure luck and persistence had more to do with it. I went up a little further for the next shot and managed to catch a bit of light on some hardwoods. I hiked quite a bit further up the trail and have a few more images that seem to hold some promise so if they play out I will post them in a day or so. I think another trip this autumn is called for – low water level and lots of color. Click for a larger view on your screen. Comments as always are more than welcome. Taken last autumn near the Malheur Field Station south of Burns. I had some guidance on toning this image from Walt O’Brien Am still working on how to get this process right so that the image has the look of a Platinum/palladium print – very hard to duplicate the real process in Photoshop but worth a try. Click for a larger view on your monitor. The forecast was for another rain front moving in yesterday albeit a bit colder than the preceding one. 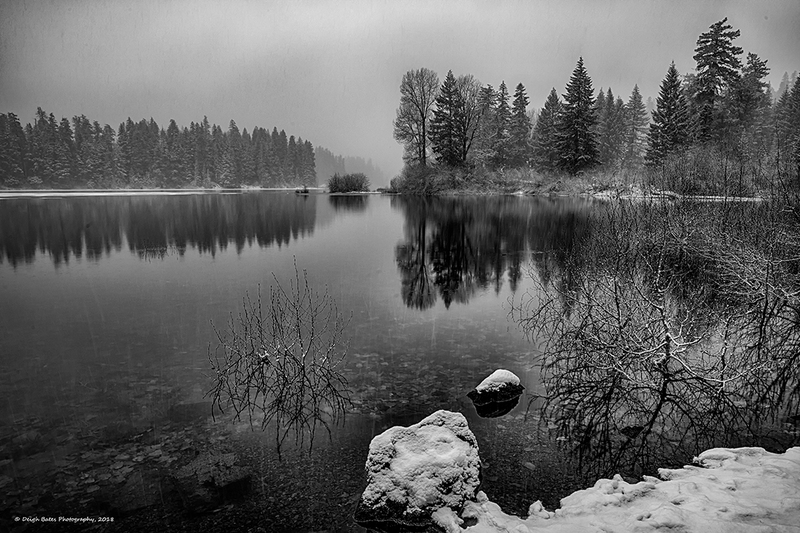 On the lookout for snow I headed toward one of my favorite places to photograph – Clear Lake and Fish Lake. 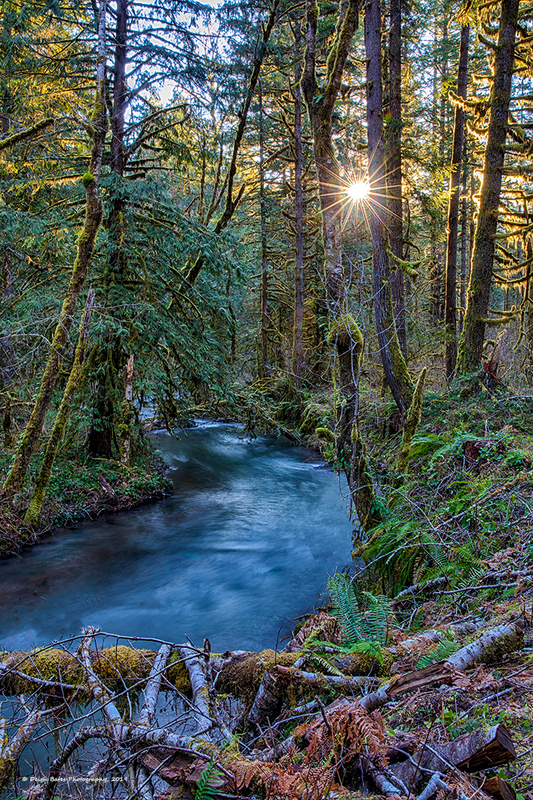 I made an intermediate stop at Olallie CG to photograph in the old growth. See yesterdays post. It was spitting snow when I left the campground and headed up river. When I got to Clear Lake the weather had morphed into a full on snow storm. I went out on the dock at the resort – seriously snowing and blowing. (I think I could hear Elvis singing Blue Christmas) Love being coated by snow. Four wheel drive on the road up the hill back to the highway and more snow on the road up to Fish Lake near Santiam Junction. Another black and white winter etching below. Time in the mountains, in the snow, with my camera is a real gift and yesterday felt like a day late Christmas present. Click on the images for larger views. This morning I headed up McKenzie Pass looking for snow – which I found near the top – but along the way I made a stop in the old growth at Olallie Campground and thanks to the book which triggered my eye to look for images — the simple forms of trees. The image below if a 3 shot panorama that measures out 48×15 inches. Please click on the image to get a larger screen view. Welcome to the forest. During my October trip to Steens Mountain I noticed a small dirt road branching from the main loupe road and decided to test out my new Subaru Forester in some real off road conditions. BTW: It did great. 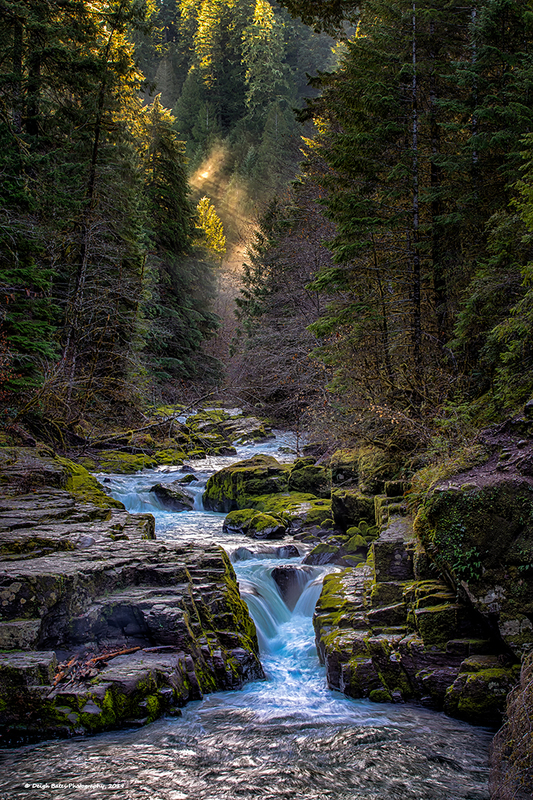 As I got near the to top of a ridge I pulled off and walked down a side canyon and came across the image below. 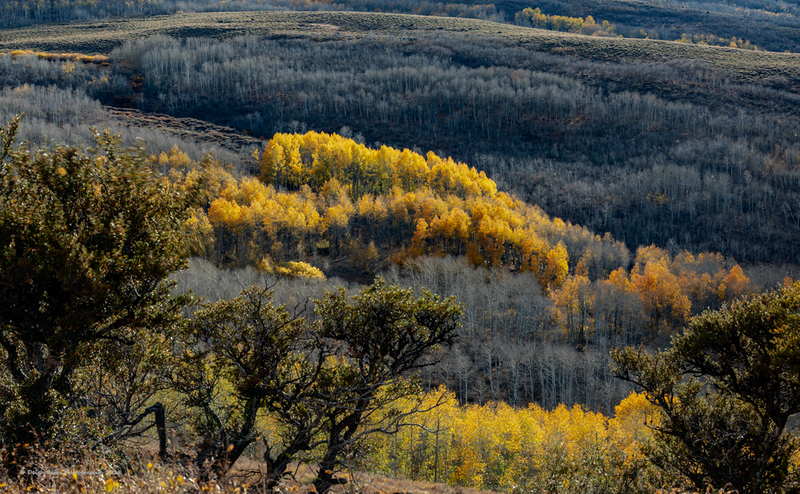 Enough light to tint the tops of the aspen. It was almost dark when I got back to the main road but I think the area was worth exploring and when all the color is on it will be even more spectacular.